I’m using 3/4” maple ply for cabinet doors and want to put a walnut frame around the doors. These are going be actively used doors and I don’t want them to fall apart. So here’s my question: Do I need to by one of those fancy router bits (v-groove or t&g) to joint the pieces together? I need a consensus on this one. Everybody seems to have a different idea about this. Which style of door and which hinges will you be using? Many questions on this as it’s not easy to answer. I think more details on the shape of the doors. Will you just use solid walnut to build a frame around the 3/4” maple plywood? If so you probably don’t need to use a router but use biscuit inserts to align and help hold the walnut framing in place and glue. You could use either square but joints or miter joints at the corners. If you are using a panel like those shows in the response above you will probably need to cope a joints in the walnut frames. There are sets of cope and stile router bits that work well but you must use them on a router table. Finally how will the doors be mounted. On the surface of the a face frame, flush with a face frame or sort of a European style with no face frame. Some of that hardware can be expensive so that may affect your decision if you have a budget. If you have a dado stack you do not need a router bit. To join the pieces together. just dado your walnut on your inside edge to accept your plywood thickness. With that said just going off what you gave for info. Your just making a flat panel front. Which 1 will not be very pleasing unless your painting them but why would you paint walnut ? 2 your dado in the walnut will only leave what an 1/8 inch each side of the dado if your using 4/4 walnut stock. (Might be less I didnt do the math). While I agree that knowing more about the doors would be useful, just going from what you asked I’d say just glue the plywood to the walnut frame. Biscuits might make it a little easier to keep everything aligned, but that would be a fairly stout door just glued together. Putting a groove in the edge to accept the ply (if the walnut is thick enough) can be easily done on a TS (dado set mentioned above). I’ve made lots of raised panel doors with those ‘fancy router bits’. They are expensive. The router bits do two things. They make the slot in the rails and stiles around the door perimeter, and they make any inside molded edge on them. They also make the raised panel edge. 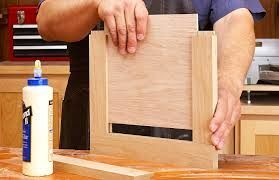 If you are making framed doors you can use plywood but it usually is only about 1/4” thick as the groove made in the frame is about that thick. You can’t use thick plywood as it is routed down thinner at the edges. You would need solid wood for that instance. You can get away with just a table saw or simple router bit. 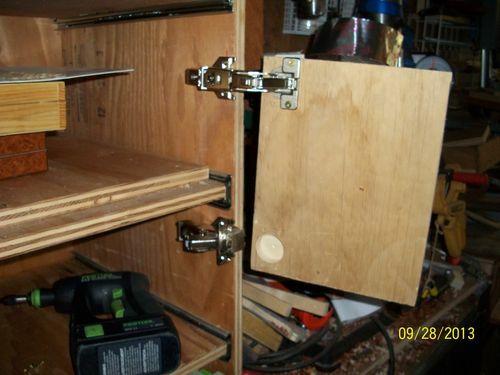 Make a simpler square frame and route or cut with a table saw a 1/4” slot in the wood to accept the 1/4” plywood. You can also make a rabbet on the backside of the frame and glue the plywood onto it after the frame is put together. Do you need a fancy router bit? No. Do the fancy router bits have to be expensive? No. I’ve had good luck with the Yonico sets from Amazon. Honestly, I could do it without but its not worth my time to try and rig something up. For clarity; I assume that, because you asked about V-groove and T&G router bits, you are wanting to glue 3/4” walnut edges to your 3/4” plywood. You are not trying to build a floating panel door as Craftsman On The Lake pictured. If I have this correct, then no, you don’t need router bits. However, either will do the job if that is your preference. You can do it easily on the table saw. For me, the easiest would be to cut a center groove in both the plywood edge and the walnut edge and then use a floating spline to glue them together. You could also cut a groove on one piece and a tongue on the other. Either would work fine with the plywood panel. If your center panel were made of solid wood, it would need to be floating as pictured above. Easier yet is to use 1/4 ply that will fit in a standard panel groove. Also, be sure to build a mock up as maple and walnut will look like hell when applied to a full kitchen. They have been making cabinet doors for a few hundred years now. I would stick with with one of the known proven ways of making doors. I personally use router bits for the rail, stiles and panels. You could dado cut a 1/4” slot in the rails and use a round over router bit for the design shape, cut the tenons on the stiles to fit the 1/4” dado cut on the rails. Then use 1/4” plywood sheets for the panels. This is the way my kitchen cabinets were done by a local cabinet maker, 20 years ago. I m using 3/4” maple ply for cabinet doors and want to put a walnut frame around the doors. These are going be actively used doors and I don t want them to fall apart. So here s my question: Do I need to by one of those fancy router bits (v-groove or t&g) to joint the pieces together? I need a consensus on this one. Everybody seems to have a different idea about this. My only question is why are you going to use 3/4” ply for a door panel? 1/4” or at most 1/2” will be the norm. Using a door is different than using a walkboard for a scaffold. There will not be a 250# Man, and another 100# of tools crossing it at any time, or if there is, you use doors a lot different than I do. If someone insisted I use 3/4” ply for a panel I would use 6/4 walnut stock, and cut a 3/4” rabbet/rebate on the back inner edge, and use stick and cope to build the panel around that massive plywood, but I’d try to talk them out of 3/4” ply on the door panel. For the box, ok, not the door panel though.